Rajasthan Public Service Commission has scheduled the written test for 3rd Grade Teacher Posts. Hopefuls applied for the RPSC 3rd Grade Teacher Posts will have to appear for the Rajasthan Eligibility Exam for Teacher (REET) as per the scheduled dates. Before attending the test, applicants are advised to download Rajasthan REET Admit Card/hall ticket to proceed with the examination. The test will be held in offline mode. Applicants must carry the admit cards to the examination, otherwise, the examination authorities will not allow the aspirants to attend the test. Visit the Rajasthan Government Educational Portal, education.rajasthan.gov.in to download the admit cards. Candidates can observe the various details about the Rajasthan 3rd Grade Teacher examination, hall ticket information, and guidelines from the following article. Rajasthan BSE annually announces various posts in the state. Hopefuls having suitable educational qualification can apply for the Rajasthan REET Teacher posts. The Rajasthan board is going to shortlist the candidates by conducting the written test and interview rounds. Candidates will be shortlisted through the Rajasthan Eligibility Exam for Teachers (REET). The REET Examination Level 1 – 1st to 5th class – will be held for aspirants seeking to become primary grade teacher and REET Level 2 for 6th to 8th Class – will be conducted to the aspirants who wish to become secondary grade teachers in the state of Rajasthan. This year Rajasthan BSER has announced massively 26000 Grade III teacher posts. A large number of aspirants have applied for Rajasthan REET teacher jobs from 14th April to 30th April. The Rajasthan Public Service Commission (RPSC) is going to conduct the 3rd Grade Teacher written test shortly. Hence applicants can get ready to attend the test by downloading the admit cards. Applicants can download Rajasthan REET Admit Card/Hall ticket 2018 before 10 days of the examination (approximately). Candidates applied for REET 2018 can stay checking the official portal, education.rajasthan.gov.in for more updates. Candidates applied for 3rd Grade Teacher, Special Teacher posts in Rajasthan can download the hall tickets and keep them safe to carry to the examination. The hall ticket/admit card contains the information of examination center, date and time of examination, candidate’s name, register number, date of birth, signature, photo, and other details. Candidates also have to carry any of the valid identity proof such as Aadhar Card/PAN Card/Driving license or any other identity proof along with the hall ticket. 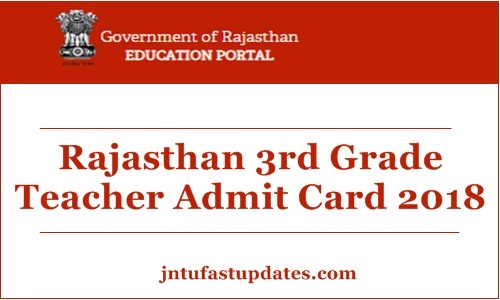 Aspirants can follow the process given below to download Rajasthan 3rd Grade Teacher admit card. Take the printout of your REET Hall Ticket.